The African Society for Laboratory Medicine (ASLM) joins The American Society for Clinical Laboratory Science (ASCLS) in celebrating Medical Laboratory Professionals Week (MLPW), or “Lab Week”, 23-29 April 2017. Now in its 42nd year, Lab Week presents an opportunity for laboratory professionals to raise awareness about the importance and critical contributions to public health made by clinical laboratories and the people who work in them. Lab Week and its theme “Laboratory Professionals Get Results” take on a special significance for laboratory professionals in Africa, where in most countries there is less than 1 laboratory professional per 10,000 citizens  – far short of the levels required to meet need. At the same time, the importance of laboratories in combatting the myriad public health threats unique to Africa only continues to increase. From accurate diagnosis of neglected tropical diseases and control of infectious disease outbreaks such as Ebola to surveillance of antimicrobial resistance and monitoring the rise of non-communicable diseases, African laboratories and laboratory professionals are urgently needed not only to ensure global health security, but to ensure the health and well being of all Africans. Seventy percent of clinical decisions are (or should be) based on laboratory test results. Despite the increasing access to point-of care assays that are feasible for community health workers to administer, the vast majority of reliable test results depend on sufficient numbers of skilled laboratory professionals. This makes laboratory workers key members of the health care community to prevent and detect diseases, including infectious outbreaks that threaten global health security. In resource-limited settings in general, and Africa in particular, the contributions of the laboratory profession to health care delivery remains insufficiently recognized by the public, the cure and care services and the health authorities. The demand for laboratory diagnostics remains low, and the development of the laboratory workforce is often overlooked in health policies and plans of African countries. Laboratorians continue to work in the absence of staffing norms, career perspective, and adequate professional environments with little opportunity to be represented at higher managerial level. Thus, raising awareness about the importance of laboratory diagnostics and recognizing the laboratory profession remain top priorities. These efforts should be continued beyond the context of HIV, tuberculosis and malaria, across the whole healthcare system to improve other ‘less featured’ health issues, such as non-communicable diseases, maternal health, prevention of antimicrobial resistance, etc., that affect millions of lives in Africa and worldwide. ASLM’s celebration of Lab Week is focused on inspiring African laboratory professionals by showcasing the critical importance of their work in key areas of healthcare in Africa and other resource-limited settings. One objective of Lab Week is to educate healthcare professionals, the public, and others about the role of the laboratory professional in patient care. With this in mind, ASLM encourages African laboratories and laboratory professionals to participate In MLPW by sponsoring activities to educate their clients, boost the morale of co-workers, and engage public health officials. Download the MLPW Promotional Guide – The MLPW guide, published by the ASCLS, contains numerous ideas for building awareness about and celebrating the profession of laboratory medicine. SOCIALAB Project [Video; French with English subtitles] — This video highlights an anthropological and quantitative investigation into barriers to the use of laboratory screening tests for antenatal care in Sénégal. Viewers will also find recommendations for improving the use of laboratory testing, as well as commentary on the importance of laboratory testing. South African Biomedical Scientist: Bongiwe [Video, English] – This video presents the story of Bongiwe, a laboratory professional originally from a rural area of KwaZulu-Natal. After being turned down for admission to medical school, she discovered a rewarding career in laboratory medicine and is now working at the KwaZulu-Natal Research Institute for Tuberculosis and HIV in South Africa. Visit and Follow ASLM on Twitter – During Lab Week, ASLM will be sharing information and stories about the importance of laboratory professionals in Africa and the work they do. 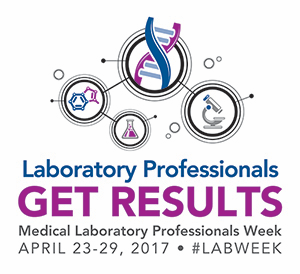 If you are on Twitter, be sure to follow us at @ASLM_News, tag us and share your stories with the hashtags #LabWeek or #Lab4Life! Not sure what to tweet about? Here are some ideas from ASCLS: #Lab4Life 30-Day Challenge [PDF file]. Labs Are Vital – This website acts as a hub for educating, promoting, celebrating and connecting laboratory professionals all around the world. Divining Without Seeds: The Case for Strengthening Laboratory Medicine in Africa. Iruka N. Okeke. Cornell University Press: New York. 2011. Vanker N, Faull NHB. Laboratory test result interpretation for primary care doctors in South Africa. Afr J Lab Med. 2017;6(1), a453. Nkengasong JN. The diagnostic–clinical chasm: Work in progress? Afr J Lab Med. 2016;5(1), a586. Jegede F, Mbah HA, Dakata A, et al. Evaluating laboratory request forms submitted to haematology and blood transfusion departments at a hospital in Northwest Nigeria. Afr J Lab Med. 2016;5(1), a381. Van den Broek A, Tuijn CJ, Van ’t Klooster L, Msoka E, Sumari-de Boer M, Chilongola J, Oskam L. Understanding the interface between clinical and laboratory staff. Afr J Lab Med. 2014;3(1), Art. #127, 6 pages. Tuijn CJ, Msoka E, Mushi DL, Sumari-de Boer M, Chilongola J, Van den Broek A. The interface between clinicians and laboratory staff: A field study in northern Tanzania. Afr J Lab Med. 2014;3(1), Art. #126, 7 pages. Lulie AD, Hiwotu TM, Mulugeta A, et al. Perceptions and attitudes toward SLMTA amongst laboratory and hospital professionals in Ethiopia. Afr J Lab Med. 2014;3(2), Art. #233, 6 pages. WHO. Atlas of African Health Statistics 2016 : Health situation analysis of the African Region. WHO Regional Office for Africa, 2016. Brazzaville.